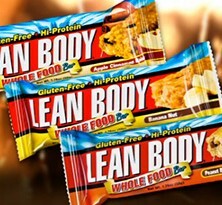 Lean Body® Whole Food Bar is the new 100% All-Natural, Gluten-Free protein bar from Labrada Nutrition. 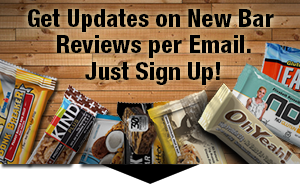 Lean Body® Whole Food Bar tastes great, is low in fat and sugar, and contains only natural, wholesome ingredients. It contains NO GLUTEN, NO ARTIFICIAL SWEETENERS, NO ARTIFICIAL COLORS, NO SUGAR ALCOHOLS,…only the good stuff, no junk! They’re perfect for snacking, after your workout, or any time of the day that you want to satisfy a craving with a healthy food! INGREDIENTS: LeanPro® Protein Blend (Dairy Protein Crisps, Whey Protein Isolate, Milk Protein Concentrate, Whey Protein Concentrate), Tapioca Syrup, Whole Grain Rolled Oats, Vegetable Glycerine, Peanuts, Natural Peanut Butter (Dry Roasted Peanuts), Cane Sugar, Chocolate Chips (Sugar, Cocoa Butter, Soy Lecithin, Natural Flavors), Peanut Flour, Rice Syrup, Peanut Oil, Water, Gum Arabic Powder, Natural Flavors, Natural Chocolate Flavor, Vanilla Extracts, Salt. 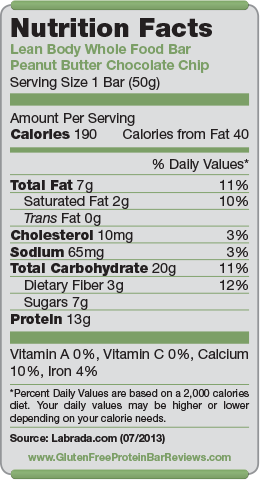 Nutrition facts based on Peanut Butter Chocolate Chip flavor. Facts and ingredients vary by flavor. One of the World’s most well-known and celebrated bodybuilding legends, Lee Labrada holds 22 professional bodybuilding titles, including the IFBB Mr. Universe. He is one of few pro bodybuilders in history to consistently place in the top four at the Mr. Olympia competition (the “Super Bowl” of bodybuilding) for seven consecutive years – a feat he shares with Arnold Schwarzenegger. In 2004, Lee was inducted into the IFBB Pro-Bodybuilding Hall of Fame. He has appeared on the covers of more than 100 bodybuilding and fitness magazines and has been featured on CNBC, FOX, NBC, ABC, CBS, CNN and ESPN as a fitness and nutrition expert. The Apple Cinnamon Raisin got by far better reviews than the Banana Nut flavor. The Peanut Butter Chocolate Chip does seem to lack the actual chocolate chips, because there’s no sign of them in the bar even though they’re mentioned on the wrapper. However, there currently aren’t enough buyer reviews on the web in order to get a good idea of the taste. If you’ve tried any of these bars yet, please leave a comment with a rating. No chocolate coating, but also not sticky. Dry in the inside due to the oats and chewy on the outside. Some resistance when taking a bite. Overall juicy, easy to eat and no mess. Buyers like the rolled oats, as well as these bars being very low sodium, fat and sugar, which makes its nutritional profile fairly clean. With $2.49 per bar at retail Lean Body Whole Food Bars come at average cost in this category. Sorry, Lee Labrada! Not a big fan of the Banana Nut. There are just so many other bars on the market, that are really good and taste much better.